Shimla to Kaza - A Road Review - Ghumakkar - Inspiring travel experiences. Its not very common for me to not rush my road-reviews. Yeah thats two nots, read again. Its not very common for me to not rush my road-reviews. But as you grow up (and old) you sort of start to mellow down. In my case I would still blame on office-work, home-work, in-transit-work for my procrastination rather then this mellow philosophy, after all in the end we did drive all the way from Delhi-to-Shimla-to-Kaza-to-Manali-to-Delhi. So here’s a road review of Shimla-Kaza circuit. Delhi-Shimla is already covered here and any updates on that route are best to be found there. Shimla-Kaza is a long one and its not a single day-light drive. We did in two parts, first Thanedaar-Sangla and then Sangla-Kaza. Both took a great part of day. As you approach Shimla, you would find a fork, the right of which goes to Rampur via Shimla-bypass. It seemed like a obvious choice but our confirm-at-next-turn experience made us take a U turn. When we asked few bus drivers, we were almost forced to go back since the bypass road is much more longer or so it was told. As a result of that U turn, we entered Simla city, after a while took a left which goes through a tunnel kind of thing and then it was Simla everywhere. Being the capital city, Simla is pretty big and if not it being a hill, it would compete very closely with other bigger towns in terms of overall chaos, garbage, haphazard development and what not. We had started from our home at Indirapuram, Ghaziabad sometime around 0530 hrs and it was already beyond 2, so we ignored the city and after a 30 minute slow but moving drive, we carried on towards our destination of the day viz. Thanedar. Thanedar is the apple country of India and I would try to do that story separately. As we went past Kufri, I called up the hotel guys and was told that it would be at least 3 hours away, so we stopped for lunch at the roadside dhaba. It was a fairly clean dhaba and our steward-waiter had this high-pitch tone, made us wonder that probably Pankaj Kapoor researched this accent for ‘The Blue Umbrella‘. We reached Thanedar which is not on main highway and left next morning at around 1000 hrs. We were on inside roads and with couple of clean-the-windshield-using-stream-water and giving a lift to a lady, ensure that we spent close to 2 hours before we joined NH22 again. It was lovely driving through winding inner roads, flanked with apple orchards, with no traffic and hardly any movement. As we drove further, the road gets wider and better. There is a large Power Plant thing being done and from now till Spillow, power plants were constantly accompanying us, seemed as if HP is going to be the power capital of the world. Gradually Pines gave way to Eucalyptus and it was difficult to believe that we are really in Hills. Later we figured out that Rampur is at 900-1000 m while Shimla is at 2200-2300 meter. Thats quite a gap. So courtesy non winding wide roads, we picked up speed and with in no time we found ourselves at Rampur. Rampur seemed more industrious then Simla. We were now in Kinnaur. AS we approach Wangtu, you would encounter a massive power plant project by JayPee group. Roads are all gone, probably for a better future. You gain height and roads jutting out of rocks becomes a more common sight. As you go further from Simla, the vehicle density keeps going down and while there were lot of truck movement because of power project, we started to see less of roadways buses, jeeps and other local transport. The landscape is green, rocky and big. The canvas is beginning to grow and you now can see far and wide. We took a break post Wangtu and had our thought-fully packed-lunch which our hotel guys gave us. It took just a small request to a small sweets shop to let us sit inside and have our food. We did try to buy a coke and few munchies to keep him in good humor but guess that was not needed. We carried on. Its so much different to be in a shop with no rush. A couple was enjoying the soda pop waiting for the next bus, the guy must be in late twenties and from the conversation which I could gather, he seemed to be in a mood to stretch it and ensured by convincing his partner to skip the bus which came while we were not done with our food. More of Kinnaur in Pics. Its beautiful. A note for my fellow ghumakkar, biker dude, Indians do not need to take any permit in Recong Po or infact till Kaza, as you pass through Espillo you do need to get registered and again at Sumdoh. Our destination of the day was Sangla, a beautiful valley and Karchham was our point of detour. 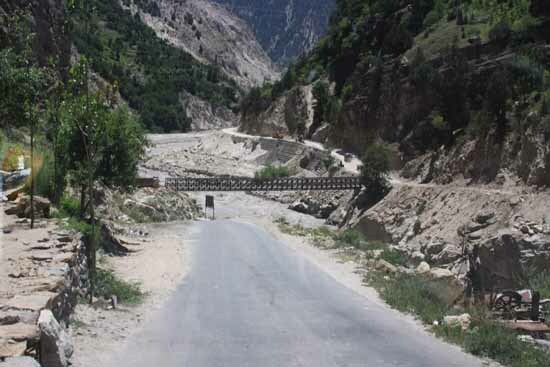 The road from Karchham to Sangla is best left unaccounted. Well, its a single lane narrow road with a gorge on one side and towering rocks on the other. The road is as winding as it would want to be and if there is an oncoming vehicle and if you are on the gorge side, well it does test your nerve. A miss or a slip or a push can make things end. 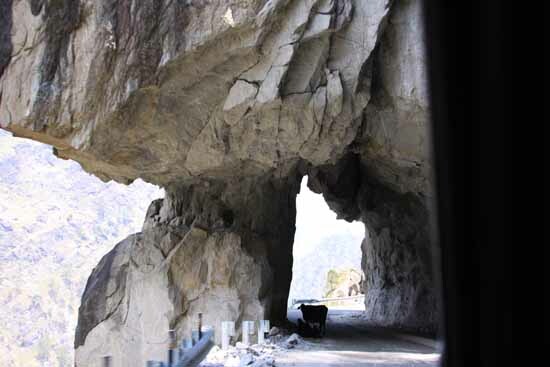 Sorry to scare you but if you are ever going towards Sangla, ensure that you reach Karchham when its broad day light. When we reached our camp, it was almost 5 PM, it was heartening to listen to other folks on how dangerous the drive was. You are never alone. You come back to Rakccham to join the main road which would be with you till Sumdoh. There is hardly any traffic till Rakccham but as you hit it, the power-plant-caravan catches up. 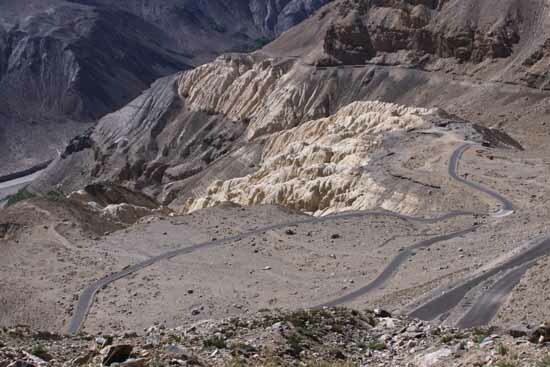 Keep driving among tall mountains, an accompanying river to keep the monotony away. Take extra caution to fill-up the tank at Powari since that’s the only petrol station you would find before Kaza. It was noon and we passed several very small villages which in fact could hardly be noticed but owing to a little bit rough terrain, hills and almost none traffic, we were not going too quick. Sometimes absence of rush makes you go slow, strange. On the way, you see some of the huge falls, portions of roads which have never seen two vehicles side-by-side ever, since their width can’t accommodate them (ok ok.. poor joke, move on) , tall huge rocky mountains, a LOT of clear Sun and occasionally a snow-peak. I am not a sun-glass guy but sometimes its so bright that you better use them. It was not too late when we reached Espillo and there you get into the protected zone. There is a small barricade and you log your credentials with the Army there. A small quick conversation and we move further. Its gets more lonenly post Espillo. Though the distance is not too much for this section but I would rate this section as the most demanding. It could see the best of your patience, grit and perseverance. The driver in you need to take the front seat and the video-gamer would have to wait for a while. This section has the famous Khab zig. As you go further and survive some of the real bad patches, you notice that you have started climbing. And after a while you would see that you are actually going in a zig pattern with one side having a not-so-high mountain rubble wall and the other side down-looking at the previous zig-arm which you just left. Though this may not sound too harsh but each arm of zig is fairly long, probably a Km or may be less so at that scale you are climbing and as you would have guessed its a 1.5 lane road. So if you get company from the other side and you are on the dont-look-down side of zig, you have it. Its not uncommon to occasionally run into a Army caravan with their ‘Shaktimaans’ in a big long line. The views though makes up for the challenges. There are more than many places where you can pull in and take a eye full of the mammoth surroundings. I say mammoth because the mountains are like real big tall huge mountains, the Himalayas, you can see as far as you want to, as deep as you want to and sometimes feel strange to find just you, your spouse and your 4 year old as a company. You get that ‘Waiting for Godot’ kind of feeling and you really don’t think that this road can ever go to a dusty town, it might appear so much of out-of-world that you better try to get out of it and start driving again. We tried to capture the zig. Look at pictures and try to get the scale. You go all the way up and are at 3000 mtr, the place is called Ka, I believe. The snow peaks are at the same eye-level. Just be there, look around, feel special and move on. Khab has nothing more than a few auto shops but there is a village down the road, a monastery where you can stay for the night and I believe some lodges. We kept moving and noticed a raised hand looking for a lift. We let her in. She was with us till Chhango, another village few KMs away. I was surprised to find her speak very good Hindi and we got wiser about the local terrain and ways. We bid goodbye to her at Chhango and gave ride to another lady with a small baby. We drove a few meters and noticed these two backpackers. I stopped and they requested for a ride till Tabo. 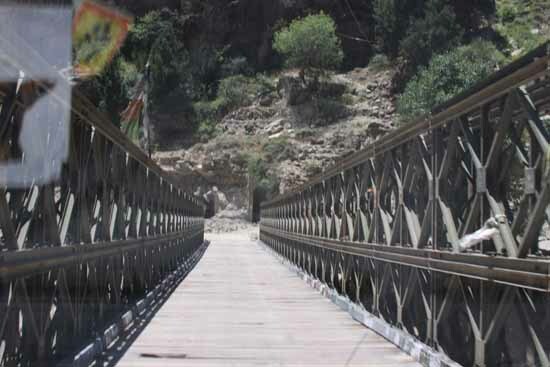 The journey from Khab to Nako sees much more habitation but you are really in an arid land now and you can’t miss it. We dropped the lady with the baby at some place and our conversation with the two backpakkers continued. The roads are good, not too wide but its simpler to drive, you do get long stretches of straight strip of tar. The guy was Peter and the lady was called Lucy, with such common names, you would not believe them assuming that it can’t be true, reminds of Badal Sircar’s ‘Evam Indrajit’ play where the protagonist says that his name is Nirmal when the other three who are accompanying him are called Amal, Vimal and Kamal. Peter and Lucy are originally from Czech but working in Afghanistan. For last three months they have been traveling in India and it was probably their 4th or 8th trip. They were with an NGO and take up assignments, save money, get out to travel. Because of their extensive traveling there were very well versed with India, Indian names, a bit of culture and all that. We did share our common interest around ***ching things we do not like. Now we were traveling amid total arid, rubble mountains. The area looks more like a part of China than India, from names to features and probably that’s what this whole country is all about, with varied cultures, varied terrains and what not. At Sumodh, we stopped again to get our vehicle registration logged. Peter and Lucy had to undergo a little more detailed procedure since their permit needed to be scrutinized. All this happened in not so much time and we moved towards Tabo by 4ish. Their being with us ensured that we got the much needed company and its not much a distance to cover from Tabo to Kaza where it would be back to three of us. We dropped them at Tabo where they were to stay there for the night at the Monastery and were planning to be at Dhankar the next day and finally at Kaza. Tabo looked like a small town with a Buddhist gateway welcoming you. Not many rather any people. 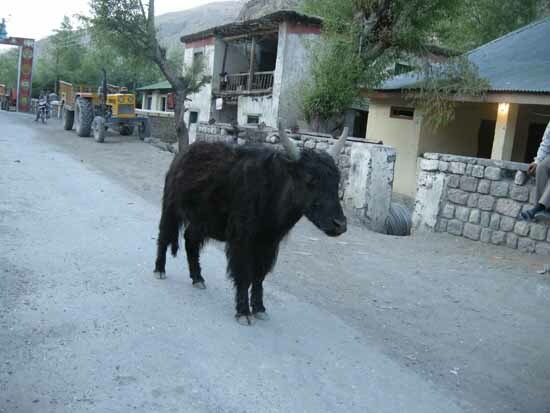 We quickly shot this assuming its a Yak. True City people. Its a cow. From Tabo, it was to be to Dhankar. You keep going, it was getting dark by now but now we could find longer stretches of straight strips. Dhankar came and went as another small clean town with the Monastery and the last leg was spent wondering on how Kaza would be. 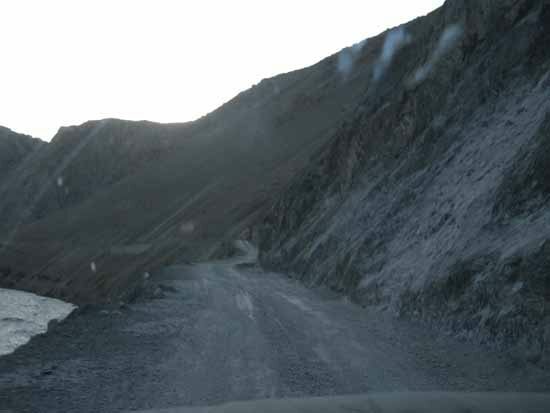 It was almost dark, 7 PM or so, when we entered Kaza and it took a bit of asking around to reach our destination. When I finally reached our hotel, and shook hands with the manager, It was hard to imagine that we have come that kind of distance from Delhi. The Kaza-Manali, the reason for which we did all of this was still left and the roads were not yet open. As I lay flat in the bed, looking around the humble room, with all our bags scattered and my spouse giving some hot-water leg-massage to our 4 year old, it was getting difficult to believe that we have finally made it. Thanks for reading this far. A day well spent. hi, can chandigarh-shimla-kinnaur-spiti-manali-chandigarh be done in an alto 800? time of travel wud be 2nd or 3rd week of sept. I recently did chd-sangla-kalpa in my alto, didnt face any problems. plz advise. ALTO is a great vehicle, light and agile. I am sure there are people who would have done this circuit on a ALTO but I wont recommend it, esp the the Kaza-Manali part. Dear Lucky – Manali-Kaza would probably be closed any time now. So I won’t recommend that route. You can still go via Shimla but that would just take too much time and won’t be possible for a 5 day tour. So not a great time to visit. i m planning to go on 10th NOV 17 is it i a good time to go there via Shimla i got to know both the way are open as of now going by bus from Indrapuram Ghaziabad hope it will be good to travel at this time . . you have any idea about bus rout ….? Hello Neeraj – I think you would have already left now. Since you asked, I have little info on reaching Kaza by Bus. But from what I could imagine, it would be going to be very very cold during this time of year. Manali-Kaza would close anytime if not already. I would avoid this time of the year, especially via public transport. Naldhera-Kaza in 3 days is not a good idea. If you want to visit that side, then I would suggest that you go no further than Sangla/Chitkul. SL is more of Ladakh thing (Hemis National Park). Kaza-Manali is one day drive and Manali-Shimla is also close to 12 hour drive. So plan accordingly. Many thanks for quick reply. I will be reaching Chandigarh on 9th June morning at 10.30. Stay at Kaza and cover Kaza on 10th night + 11th morning. I take a break at Sangla on 11th June night and reach Naldhera on 12th noon? Sorry for asking too much in detail, but it will be me, my wife and daughter travelling – so want to be sure if this is right thing to do in that terrain. Chandigarh – Manali is 10 hours. 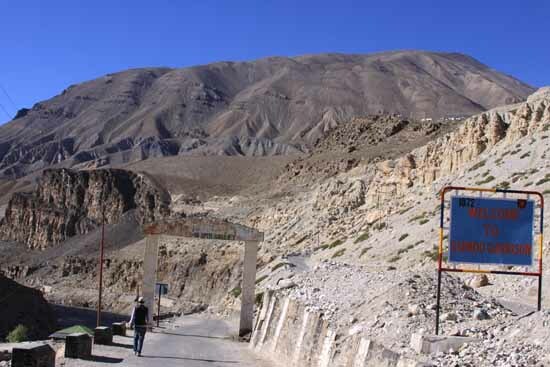 Manila – Kaza is one full day, it might take lesser but you need to cover two passes (Rohtang and Kunzum) and weather can turn in any which way, so account for one full day. Kaza needs acclimatization esp if you want to go to Kibber, Key and likes. So one day at Kaza is not a good idea. 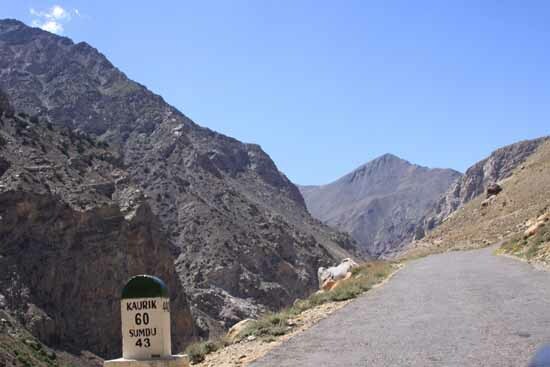 Kaza – Shimla would be about 16-18 hours drive. If I were you, I would either do Chandigarh, Kalpa, Sangla/Chitkul, Naldhera or go towards Pathankot (Dharamshala, McLeodganj, Dalhouse) or towards Manali. I would not attempt Kaza in this small window. My flight is at 14..00 from Chandigarh and whether it is possible to catch the flight if I start Journey at 5.00 in the morning in the same day ? please help me . If it is from Shimla, you should be able to catch that flight easily. It is under 4.5 hours drive. Can we plan 6 days tour (Shimla -Kaza-Shimla or Shimla – Kaza – Manali) ? Which are the better night halts in this journey ? What are the best places can be visited during these days in Kaza and in between route from Shimla to Kaza ? Dear Shiv, Shimla – Kaza is not a single day drive and if you go that far then it is better to have more time at hand. For 6 days, I would suggest that you do Shimla – Kalpa – Sangla – Shimla/Narkanda. Shimla – Kaza – Manali would be too hectic too. 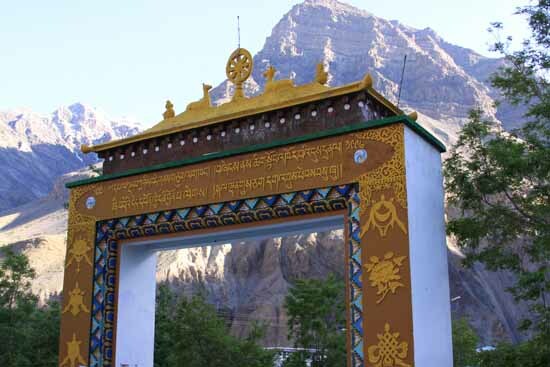 I want to visit Rekong Peo – Kaza in last week of May , and spend about 7 days totally. We are 2 adults + 2 kids (10yr, 12 yrs). Do not plant to take own car, it is a ageing Honda city. Q 1) Should I plan Shimla-Kaza-Shimla ? Q4) While we have spent some time recently in modest elevations (eg. winter break in Narkanda) , are there other precautions which would be good. 1) Shimla – Kaza – Shimla is possible but can get rushed, with 2 kids. But possible. Shimla-Kaza-Keylong-Manali is not possible because Kaza-Manali pass may not be open during that time + it would get even more rushed. 3) No idea Sir. Please loop up on net. I will do overnight journey for Delhi-Shimla and return Shimal-Delhi. Q1. 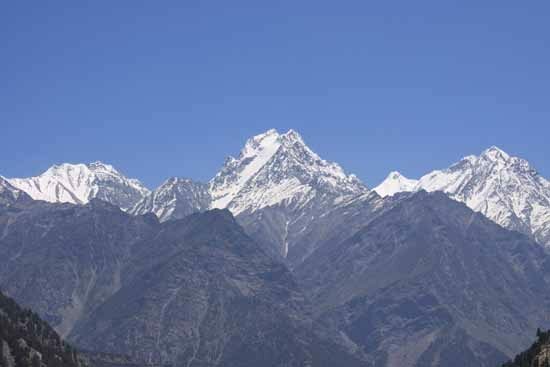 is it comfortable travel (for 3-4 adults) in 3 day – 2 night from Shimla-Sangla-Chitkul-Shimal. can i add Kalpa in this? Q2. is it suitable to travel in local Bus or we should hire cab? 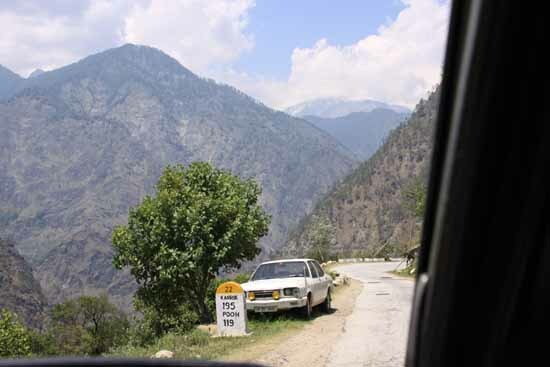 Shimla-Sangla-Chitkul is a day long drive so for 3 days, I won’t recommend this itinerary. You would be on the road most of the time. Dear Trivedi Ji – I am not sure about your starting point, so am guessing that it is Delhi. Let me try to make my best attempt to answer your queries. 2. 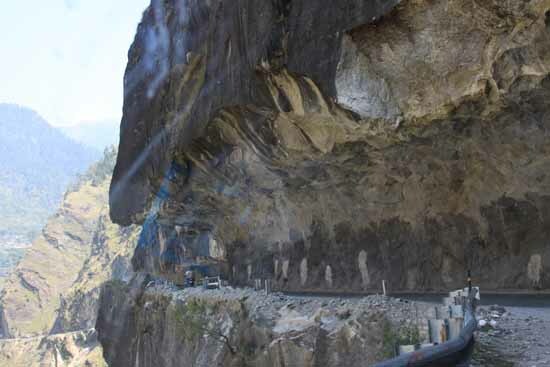 Kaza – Manali – Delhi is a shorter route provided the route is open. 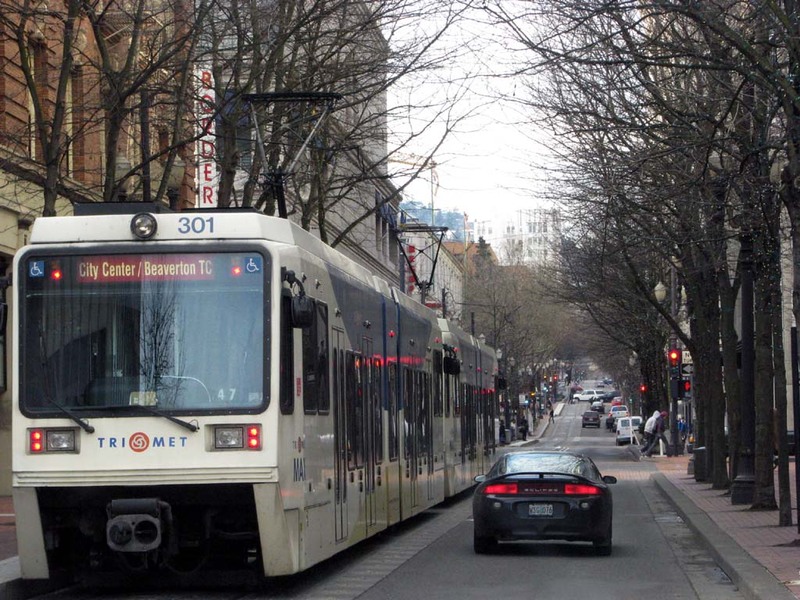 Usually the route opens in first week of June and remains open till late September. From Oct to May end, the route is closed. It passes through Kunzum-Pass and because of extreme weather (snow), the road is not open. 3. 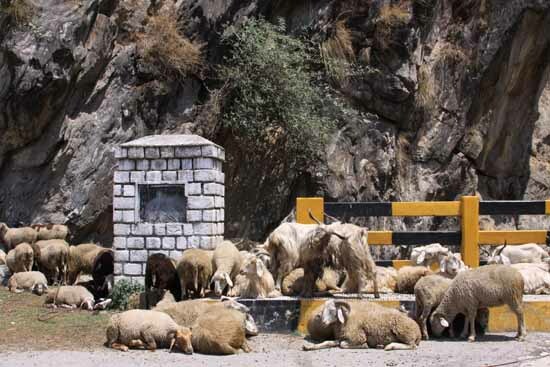 Kaza – Manali is a full day drive (do it in the day). 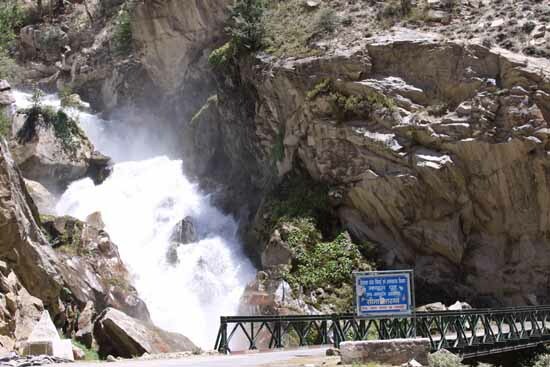 Manali – Delhi is about 14 hours drive but can be done in evening/night as well. 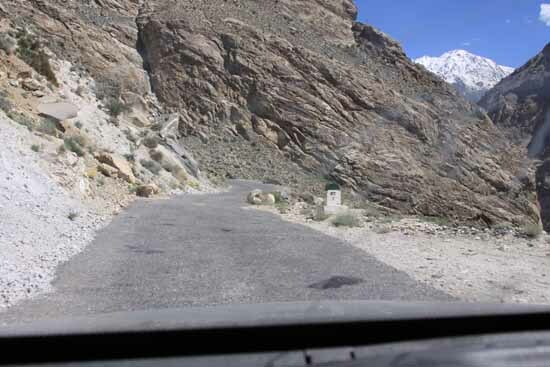 Kaza – Delhi direct would be too tiresome unless you have been doing a lot of long road-drives. I am guessing that you are not so I won’t advise that. My one of the colleague had done this Kalpa Manali circuit with swift last year while exploring chandratal without any problem. 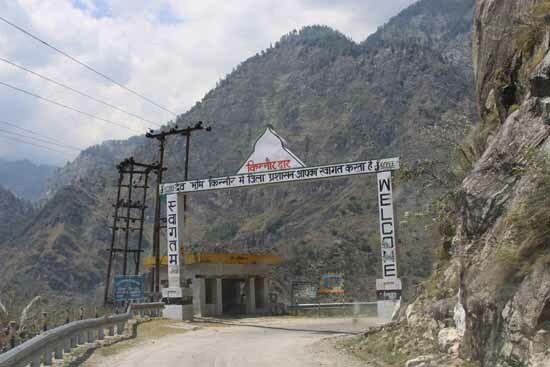 Even i didn’t had any problem in Auli,Chitkul,Kalpa,Shoja or Jhalori Pass though Wagonar. You ‘ll have be bit careful while driving on rough terrains or no road stretches. Rest depends on your driving skills…. Roads till Rampur are smooth & have good tar.Near Jhakri & Karcham it’s worst due to hydro project work. Moreover there are steep curves & hairpin bends as well. I had taken my wagonar till chitkul & kalpa though but considering ground height & length of ciaz it may be bit harsh for vehcle. Hi sir, are the roads from sangla to kaza to manali open betwenn 26 may onwards? Parmavir Bhai – Pls read Ramta Jogi’s comment just above this one. By and large, roads are fine except around Karcham because of power plant work going on, for last 10 years I think. 5 days seems too tight to me. You would not want to just drive. Also, Kaza-Manali section depends on weather. I am currently traveling (out of India) so do not know about the current weather conditions. Pls read-up on local newspapers like Tribune (you can find them online) to make a best estimate. Chandigarh-Chitkul is not a single day drive. I would recommend that you stay at Kalpa for a night. Next day, you go to Chitkul and stay for two nights. You would need to stay at some place on the way back too. If you really have 3 nights then Chitkul is just too far to make a memorable trip. Till Rampur & Jeori you can drive @ 50/70km speed but after that it would not be like that. Average speed will be 20-25 approx due to bad road conditions or hilly curves. I will suggest to stay at Sarhan with one more day in hand. In Sangla go for Hotel Rupin view …it’s pictureque. 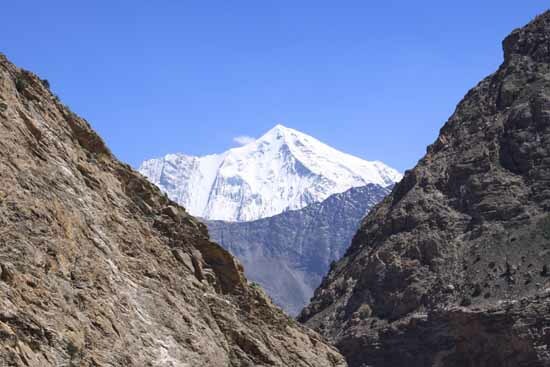 Trek till Kamru fort in Sangla & detouring towards banjara/rupin river are mesmerizing. Your post (not these but all are fascinating) is good and inspired me to plan for it. * I have 5 to 6 days in hand for Gurgaon to Kaza & back(Day 1- Narkanda/Rampur, Day 2 – Narkanda to Sangla, Day 3 – Sangla to Chitkul, Day 4 Chitkul to Kaza, Day 5 – Kaza, Day 6 – Return Journey). * Is it ok to go by Gurgaon to Kaza and back by Swift Dezire car in ist or 2nd week of June. Kailash Sir – Thank you. Sir, for 6 days, it would get extremely hectic. If you are short on time, then I would suggest that you only go till Sangla/Chitkul and head back. Day 1- Starting from chandigarh early morning and giving a break at Narkanda. Day 2- Starting from Narkanda by 12.00 pm and staying at Rampur Bhushahar. Day 3- Starting from RB by 10.00 am and reaching Kalpa. Day 4- Planning to go to Chitkul n returning back to Kalpa. 1. is it advisable to use my own car Santro for this whole travel? 2. how are the road conditions i.e if rain starts then will it be fine to drive especially from RB to kalpa? 3. Anything to carry along in case car gets into a problem? 1. Santro is a great vehicle. It is agile, light, not too big/bulky so fits fine for a hill drive. Do not overload it and if for certain stretches, you may experience a lag then just go slow. Especially at low oxygen areas, just go slow, enjoy the ride. 2. Road conditions are ok except the Karchham area where some hydro power project is going since eternity. 3. An extra tyre tube, check whether the battery is doing good, check whether the tool-kit is in order (if you have a flat tyre, you are able to change it). I was looking at your itinerary, I would suggest that you do following. Day 2- Starting from Narkanda by 9.00 am and go to Sangla. Day 3- Do a Chitkul day trip. Stay at Sangla. Day 4- Sangla to Kalpa. Day 5 – Kalpa to Shimla (and stay there). Day 6- Back to Chandigarh. If you have time then stay for another night at Kalpa. All the best. You would be going to a really really beautiful place, make the most of it. Will be it okay to drive up to Sangla and and kalpa in Maruti Ertiga petrol with Six people. What is your advise. I am planning in the middle of october. Eritga has a very high ground clearance, I guess 180 cm+, so you should be fine. Do not overload it with a lot of luggage since there would be 6 people inside. Though Shimla – Sangla is all-weather road, it would be a good practice to read abut weather before you start. All the best. Thanks a lot. Will get back to you when I actually plan the trip. Your guidance will be very valuable. Hi Nandan, Thanks for a great post! Just had a couple of questions for a trip that I am planning towards the end of this month. I plan to do a 9 day trip: Delhi > Shimla > Kalpa > Nako > Tabo and back. We are just two people and I have an i20 Diesel. Is it a good car for the route. You seem good with your plan. 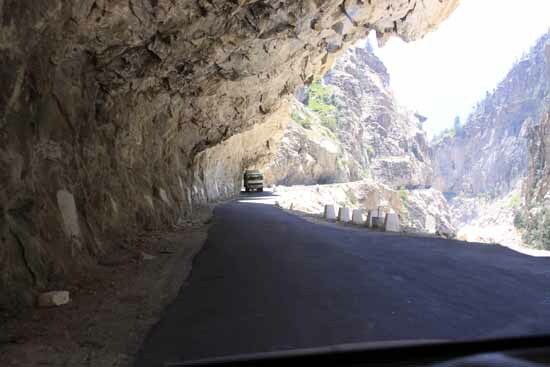 Since it would be end of June, and there would be only two of you, you might want to go all the way to Kaza and return via Manali (to save driving time). Days are longer and hopefully most of the snow would be gone so you can get past Kunzum and Rohtang faster. i20 would be awesome. All the best. I am traveling for a few weeks and not on best of internet connection so sorry for the delay. Thanks a lot for the help, Nandan! Sir , we are planning to visit kinnaur , chitkul , reo , kalpa and then kaza . sir can u tell us how much days ll be sufficient for this tour . can it be possible in 6 days tour . we are travelling it from punjab . 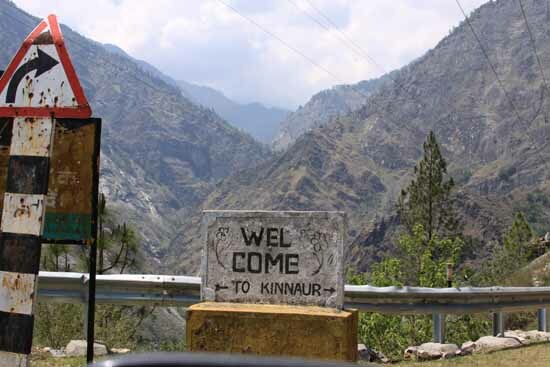 For 6 days, I would suggest that you keep your itinerary to Kinnaur so that it is not too rushed and you have enough time to relax and experience the beautiful Kinnaur. You can do Sangla, Chitkul, Reo, Kalpa. Hello. We will travelling in XUV 500. WE ARE TWO ADULTS AND 2 KIDS. We are planning to go from Delhi to stay at Narkanda and from Narkanda to kaza is it possible to travel Narkanda on first day and from Narkanda to kaza on Second day. Is XUV 500 IS FINE. How long would it take practically Take to reach from Narkanda to kaza. 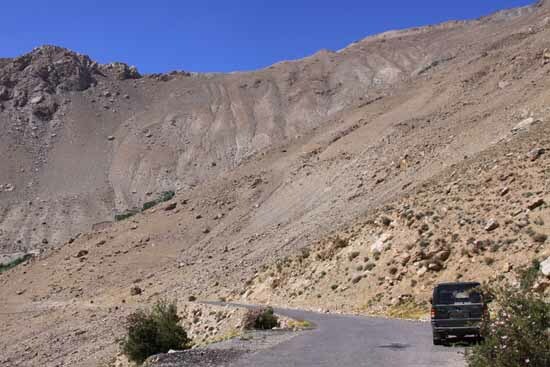 Sachin, Narkanda-Kaza is two days drive, so you can not do it in one stretch. XUV 500 is a great vehicle, so you are covered. You can break your journey at Sangla. Narkanda-Sangla is 8-10 hours drive. Sangla-Kaza is 10 hours drive. I am planning to visit Himachal in mid on June. My plan is to go from Delhi to Shimla and then further to Rekong Peo/Sangla/Chitkul. Is it fine to go by Honda City there. Secondly, can we stay at Chitkul. I mean is there any hotel to stay with family? What do you suggest. Can we do Chandigarh-Chitkul stretch by Honda Jazz(Diesel) car? I am travelling from Shimla to Kaza Monday next week via (Shimla – Sarahan – Sangla – Kalpa – Nako – Tabo – Kaza). I heard it’s raining heavily above Shimla, Could anyone please tell me about the road conditions till Kaza ? I am planning to do a Delhi- Sangla- Kalpa- Sangla- Delhi trip in approx 6 days in mid Oct 2018, can you please suggest if this is feasible? I am fine with driving long stretches and hill driving is also not an issue. Can you suggest a plan? Also update me on the road conditions. Madhav – On Day 1, try to go further than Shimla. It could be Thanedar. On Day 2 – its going to be a long one so leave as early as you can. Day 3 is fine. Stay – Shimla has millions of place to stay, Fagu is good place to explore, HPTDC. For Sangla, we stayed at Banjara Camps, Sangla. But considering that you specifically wrote that ‘we are guys’, I would recommend you to go further to Chitkul and find a hut. For Kaza, again there are many places to stay but if you want to stretch a bit then go to this highest-village, am missing the name. Watch out for AMS.